High quality white cementitious mortar, reinforced with synthetic resins and special additives. Distinguished for its strong adhesion, and resistance to moisture and frost. 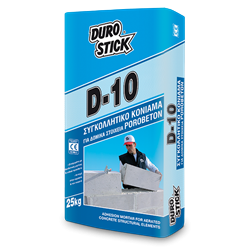 DUROSTICK D-10 adhesive mortar is suitable for all types of aircrete blocks. It ensures unbreakable bonding by developing quickly its final strengths. Apply it to build walls, both indoors and out. Its special formula makes it suitable for filling joints and spackling damaged sections on the surface of aircrete blocks.